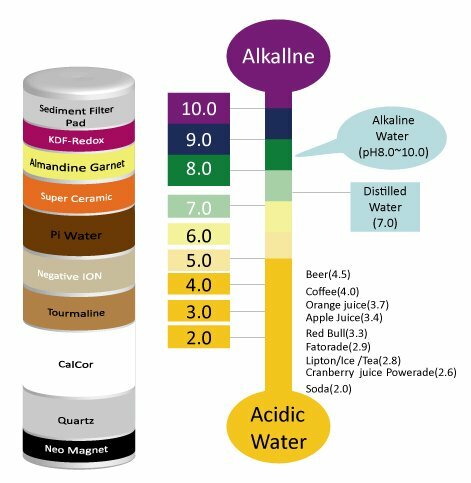 Water Doctor Alkaline Water Filter has 11 stage process starts with a high strength Neodymium magnetic module. One of the first patents for magnetic water treatment was granted in 1894. Our Quartz media mined from California’s Yuba Gold Fields and our special blend CalCor media imparts a refreshing mineral taste to the water by dissolving Calcium Carbonate and Magnesium Dioxide into the water stream, Tourmaline Ceramic emits a high capacity of Fat Infrared Rays and Negative Ions. The Negative ION ceramic media discharges a high capacity of negative ion(above 800/cc). A piceramic layer Further increases the waters HP and palatability and increases the oxidation-reduction of the water molecule “The Super Ceramic” layer contains over 10 minerals and imparts a pleasant taste to the water while emitting even more Far Infrared Rays. Almandine Garnet is a naturally occurring gem mineral with uniform physical, chemical, hardness, friability and micro-structure characteristics, which provide the essential properties for the water filtration processes. the KDF Redox later incorporates a special blend of high purity Copper and Zinc to reduce heavy metals, microorganisms, scale, and is a listed bacteriostat. The water exits through a polishing sediment filter ensuring safe, clean, and crystal clear drinking water. Essential minerals get lost during the reverse osmosis process. This filter is designed to help restore them! Alkaline water helps balance the body’s pH, which tends to be acidic because of our high acid food diet, stress and exposure to environmental toxins such as smog. Hand crafted 5th Stage Antioxidant ph Alkaline Mineral Filter with the finest minerals from around the world making it the best post membrane mineral filter in the market. Get the quality of expensive mineral bottled water at fraction of the cost! 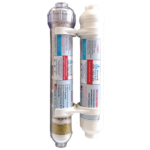 This supreme handcrafted 2″ x 10″ filter is an excellent add on for Reverse Osmosis Systems, refrigerators, and ANY other type of drinking water systems. During the reverse osmosis process many of the beneficial minerals are extracted from the water. This filter is designed to go through 5 stages to restore the good minerals which are essential for your body. Stage 5: ORP NEGATIVE A negative ORP indicates the ability to donate electrons, the higher the negative charge, the greater the ability to provide electrons. This is the level of the ability to be an antioxidant. Free radicals are oxidizers and their ability to oxidize is eliminated or reduced by the addition of electrons from atoms with a negative ORP. Substances with a high negative ORP are called anti-oxidants. (Castor oil has an ORP of -200, Castor oil is good for you). The lower the ORP (negative value) of the food or drink, the greater potential it has to reverse the aging process of the body at a cellular level.